MADRID, Spain – Builders of a massive, trouble-plagued expansion of the Panama Canal said Thursday they will make repairs after authorities there said it had sprung a leak. The canal, completed in 1914 to offer a short cut and safer journey for maritime traffic traveling between the Pacific and Atlantic oceans, is undergoing a refit to triple its capacity. The improvement to the 80-kilometer (50-mile) long waterway, which is used by 13,000 to 14,000 ships each year, has been hit by delays and budget overruns. The international consortium, which is nearing completion of a third set of locks on the canal, overran its initial $5.25-billion budget, leading to financial disputes with the Panama Canal Authority, the Panama government agency charged with operating the canal. Originally scheduled for completion last year on the Panama Canal’s centenary, the project is now only expected to be ready in April 2016. The Panama Canal Authority said Wednesday the builders had informed it of “localized seepage” found in the concrete sill between the lower and middle chamber of the canal’s expanded Pacific Locks. The consortium said water was seeping through because of “insufficient steel reinforcement,” which had been subjected to extreme stress from testing, the Panama Canal Authority said in a statement. “The contractor has an obligation to ensure the long-term performance on all aspects of the construction of the locks and to complete the expansion project following the quality standards established in the contract,” it said. Despite the repairs, the international consortium had “verbally indicated” that it will still complete the project in April 2016, the authority said. The consortium comprises Italy’s Salini Impregilio, Belgium’s Jan de Nul and Panama’s Constructora Urbana in addition to Sacyr. 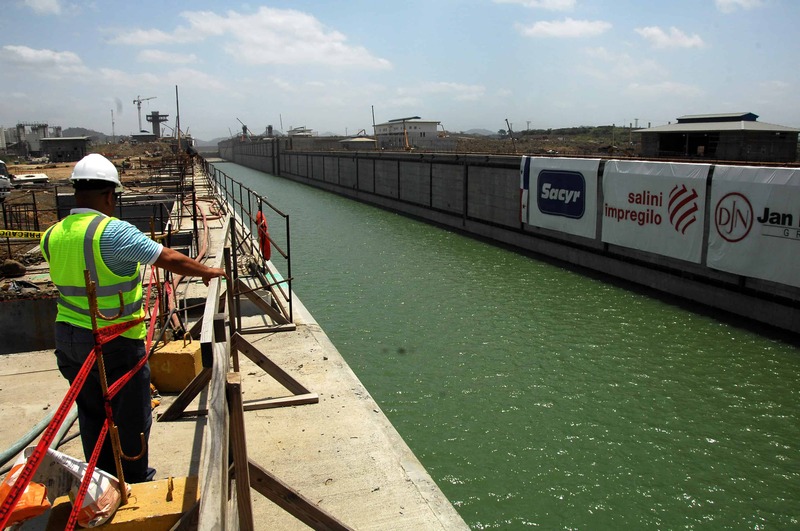 The canal handles five percent of global shipping, but needs to upgrade its infrastructure in the face of rival bids for market share from Egypt’s Suez Canal and a new Nicaraguan canal being planned by a Chinese company.